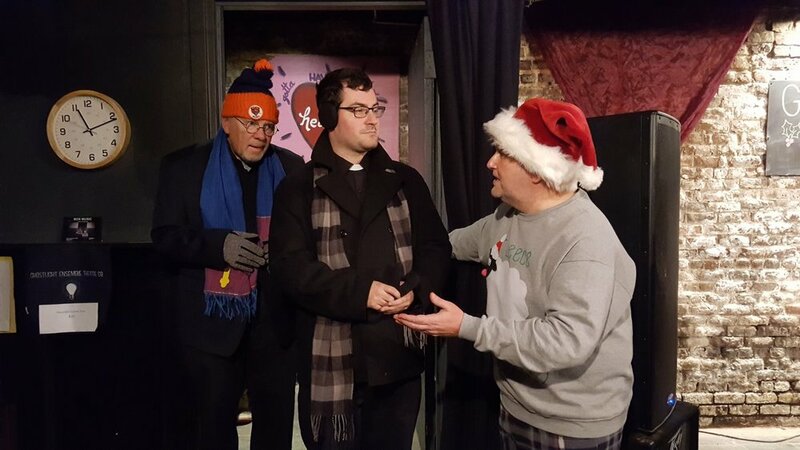 Michael Wagman, center, in Ghostlight's 2016 production of "Krampus!" "All throughout my childhood I was the shy kid in the corner. I just assumed most people didn’t care what I thought or how I felt. In the broad scheme of grade school life I simply didn’t matter. My greatest joys came when I was by myself. Reading a book, watching a movie or working on a project. The greatest validation I found was from the joy I got doing these often lonely activities. Getting into my early and mid-teens I began a string of artistic endeavors. First it was tap dancing, then poetry, then short story writing, songwriting and oil painting (my parents’ favorite). All the while from seventh to ninth grade I also played on the golf team, but the validation I got from these activities never gave me a sense of community. I still didn’t fit in. I enjoyed the activities but rarely did I feel a close bond with the people. "Then in eighth grade, on a total whim, I auditioned for and got cast in my school’s middle school/high school production of Pippin. After that I acted in the middle school production of Joseph and the Amazing Technicolor Dreamcoat. I had a great time doing both and according to parents, teachers and students alike I seemed to be pretty good at it. "In ninth grade my golf game hit a slump and I was demoted to caddy duty until my game picked back up. Even though I wasn’t the biggest fan of all my teammates, I loved playing the game and was frustrated beyond measure that outlet was being taken away from me. Then one day at morning assembly Mrs. Haulmark, the theatre director, announced that someone had dropped out of the production of Dracula and they needed a replacement. She said if anyone was interested they should speak to her. "The stars seemed to have aligned. I’d had fun doing theatre the previous year and I’d liked Mrs. Haulmark and all the actors and techies. As an eighth-grader in Pippin I’d gotten to work with freshman and seniors alike, and our ages had never seemed to matter. We were all treated with respect as long as we did our part to make the production the best we could. And most importantly I had fun. Instead of doing my art behind closed doors there was something freeing and intimate about sharing my interpretation of a character in front of people onstage. "All my life I’d been hiding from people, assuming what I thought and felt didn’t matter. In theatre I could be onstage and what I thought and felt could be the only thing that mattered. If I did it well, what I thought and felt could keep an audience at the edge of their seats. I could feel important."